I’m thrilled to introduce Bill, our guest writer that is sharing his experience as a co-owner and manager of a resident-owned manufactured housing community. You can read much more about Bill and the community at his new blog, Living in a Resident-Owned Community. I’ve lived in a sixty-unit mobile home community in Freeport, Maine for twenty years. For sixteen of those years, I thought, felt, saw, and did the same things most other mobile home park dwellers thought, felt, saw, and did. I knew exactly two of my neighbors and felt that this had to be temporary until I could find and afford a piece of land of my own. I looked out my window to see other homes that looked almost exactly like mine, each with their little driveways and endless, dark hallways. In 2015 all of that changed when our park converted to resident ownership. Today, I know every person in that park by name and they know me. 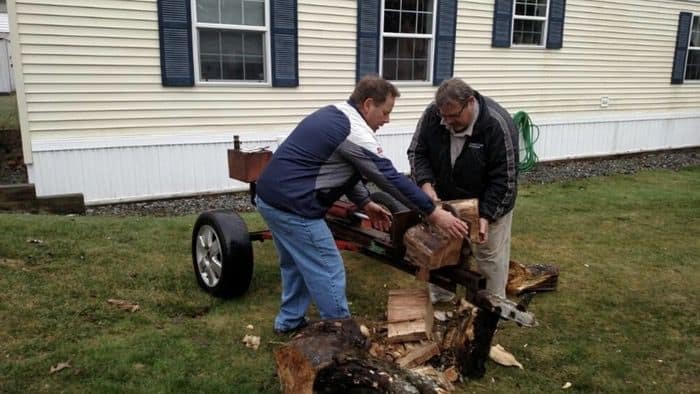 If I am out in my yard building or fixing a shed or a deck, before I know it, several of my neighbors show up uninvited with their tools in hand to help out, and I do the same for them. There are constant social activities – barbecues, campfires, cribbage tournaments. I love my park and the people that live here. We own it, so we take pride in our park and we care for one another. When I look out the window now I no longer see the ticky-tack houses. I see family. This is my story. It is how I came to be where I am. In June of 1975, Carol, the love of my life, was graduating from high school. We were making plans for our wedding in August. Seems like a whirlwind and it was, but that’s the way things were done then. My brother, ten years my senior, had gone into the Navy when I was nine and had gotten married just as quickly. He was my hero, so because he bought a mobile home when he got married, I did the same. 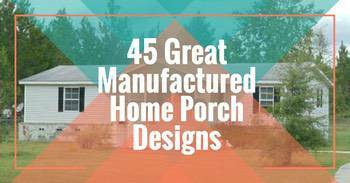 We started our lives in an old, blue, 12 x 60 home with two tiny bedrooms with crank-out, louvered windows. We sold that in a year or so and bought a ‘real’ house. Fast-forward to 1999. Both of our kids were flying the coop and both of my parents had recently passed leaving me a little bit of loot. It was time to downsize. Remembering only the good parts of mobile home living, we bought a home from a friend, found a lot in a park in Freeport, and set up housekeeping. For fifteen years we were happy tenants of the Freeport Housing Trust. Then, in August of 2014, we received a letter from the Trust which told of their intention to explore converting the park to resident ownership. A meeting was to be held at the town library and all the residents were encouraged to attend. Off we went to this meeting, not really knowing anybody and having very little knowledge of what this was all about. The short story about that meeting is that two groups, ROC USA and the Cooperative Development Institute, gave an in-depth presentation about the fundamentals of resident ownership and explained what they would do to help us toward that goal. The residents at the meeting voted to move forward and to look at the possibilities. That night, I joined the committee to do that work and report back to the residents. That committee held a lot of meetings over the next nine months. While ROC USA negotiated a fair price with the seller and found lenders to work with us, the committee, with guidance from our Technical Assistance Provider from the Cooperative Development Institute (CDI), set up our not-for-profit corporation, established long- and short-term budgets, set up preliminary policies and procedures, and established basic rules and by-laws for the governance of the park. 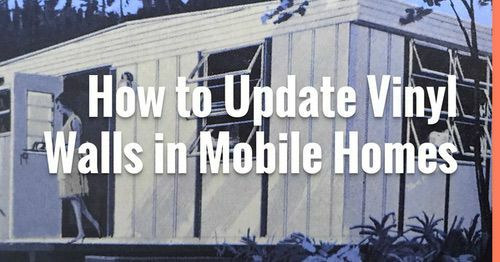 Learn about the history of mobile home parks here. We also decided to spend the money to have an infrastructure study done so we would know before the purchase what our needs would be for the future. In April of 2015, a vote was taken by the residents which passed by an acceptable majority. On May 13th our president signed the papers that officially made us a resident-owned community. Immediately, a Board of Directors was formed and I was elected to sit on that board with eight of my neighbors. Ultimately, I became treasurer and chairman of the membership committee. My beautiful bride – who has been by my side now for more than four decades – is our vice-president. The groups with which we work closely, ROC USA and the Cooperative Development Institute, continue to offer guidance and training which I take advantage of at every opportunity. It sounds like a lot of work, but it’s really not. Besides, I love what I do here, and I am happier living here and serving this community than I have been anywhere in my life. You’ve heard me ramble on about my friends at ROC USA and the Cooperative Development Institute. These guys were the major keys to our success in both buying our park and managing the community after the sale. There is nothing special about the residents of our park or the Board of Directors – we are all just blue-collar people. 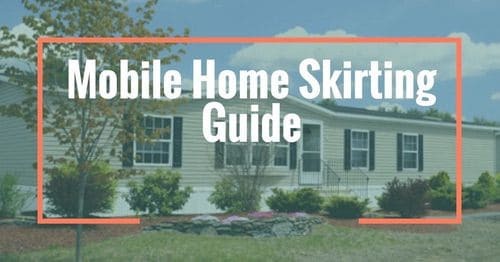 Learn about the Advantages and Disadvantages of Mobile Home Parks here. Many of us are retired and some are disabled. It was ROC USA and the Cooperative Development Institute who guided us through turning this run-of-the-mill mobile home park into a flagship resident-owned community. We could never have done it without them. 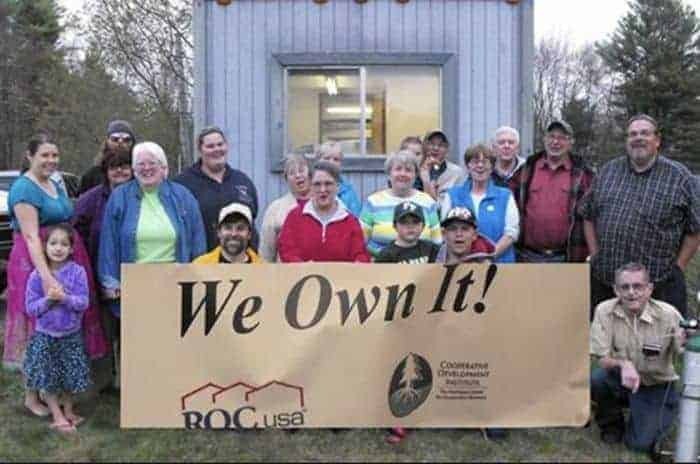 ROC USA is a non-profit social venture promoting and assisting in the resident ownership of manufactured home communities. Please take the time to watch this video and let Paul Bradley, President and Founder of ROC USA tell their story. The ROC USA website can be found here. The Cooperative Development Institute, or CDI, is an affiliate of ROC USA. They furnish Certified Technical Assistance Providers to resident-owned communities throughout much of New England. ROC USA has a number of these affiliates across the country. This Technical Assistance Provider, or TA, works with the Boards of Directors at the parks on a day-to-day basis. Ours is there for us constantly, attending two meetings a month and answering our calls and emails at some very odd hours. CDI’s website is here. A few years ago, they produced a video about some of the parks in Maine. You can see that here. The nice guy who starts the video talking about his father is the president of my community. There is the whole story. I hope you are here because you are either thinking of joining a resident-owned community or, even better, becoming one. If either is the case, I hope you will jump in with enthusiasm. There are so many benefits and so few disadvantages. Be sure to follow Bill on his blog here! 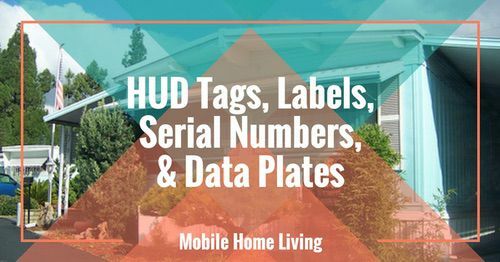 We are big supporters of resident-owned manufactured home communities here at Mobile Home Living. If we had it our way, every park in the country would be resident-owned. It would help reduce the absentee investors that just want to collect checks and increase rent every year. It would also serve as protection against impromptu evictions due to park closures and help homeowners become landowners which would have a significant effect on their ability to gain equity on their homes. Resident-owned manufactured home communities could very well be the solution to whole lotta problems. Have you been part of a resident-owned park? We’d love to hear about your experience. 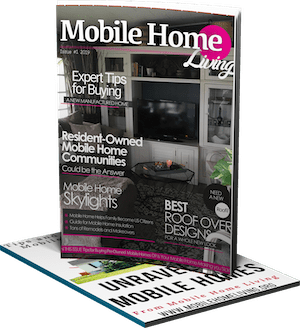 Thank you, Billy, for sharing your story with us!Thank you for reading Mobile Home Living! Greetings all, We live in a 55+ Community. It is considered a condominium complex. Each person owns the lot their home sits on but all green belts, pools etc are community. Our HOA fee is $180.00 per month. That includes trash and water and common area upkeep. I feel like I live in a resort. The streets are wide; landscaping is nice; clubhouse is great but best of all for me is the pool which is 88-90 degrees year round! We are in San Diego County and since you own the lot it is not cheap but compared to standard house prices in this area it is a bargain. I also don’t understand why other boomers aren’t jumping in. We are near shopping and healthcare. Age Range is 55 to over 100! I bought in 2012 at age 56; one of the best decisions I have ever made. Have put on a new roof; thermal windows; wood stove and Vinyl plank floors in bedrooms. Bathrooms were already updated and laminate floor was already in kitchen, dining and family room. We put new carpet in living room.My living room overlooks one of our green belt areas, it is about 2 acres. Lots of bird watching.Find a real estate agent that sells mobile homes, they know the good parks and which are ROC. There are a few other resident owned parks in Northern San Diego county that I know of. We even have a fenced doggie park! Your community sounds wonderful! 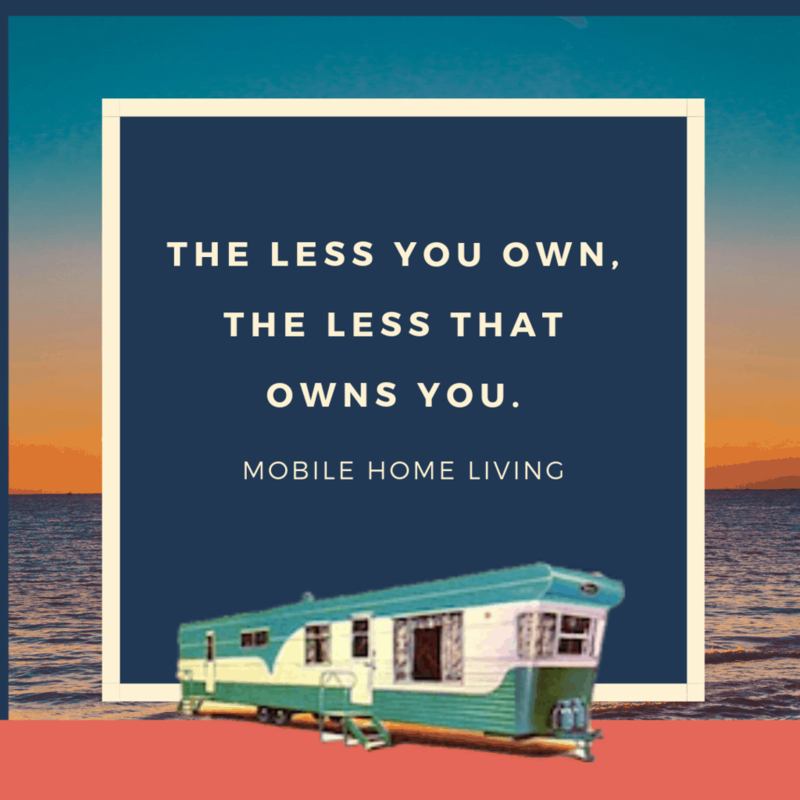 I think as the baby boomers start retiring they will catch on that mobile home living is a great choice to downsize and live on less. Hearing about parks like yours certainly helps break the stigma. Thank you so much for sharing! I live in a 55+ park in Tucson, Arizona. We are a for-profit, resident-owned cooperative. The homes are all quite nice, the park is clean and up to date, and our space fees range from $145 a month for single wide to $165 for triple wide lots, as per the shares associated with the lots. It is a GREAT way to live. It is like living in a small town, and you see your friends and other members on a daily basis. About half our residents leave in the summer, leaving the place all the the rest of us! I bought a 1983 14×70 for $39,900. We have fixed and updated, and added a ‘she shed’ and fencing to our place, and likely if were to sell, would list for $65,000. Our electric and our water/sewer are all billed through the park, and are very cheap because the usual fees that are standard on every bill are shared rather than individual. We have 2 pools (one indoors), a jacuzzi, 2 9′ pool tables, a restaurant class kitchen, library, etc. Comanche Wells is a great place to live. And we are within a mile of all shopping, and near first class medical facilities as well. I wish there were better ways of finding out which parks in different states are resident owned and function like ours. With the economical costs of each, we could afford to own another mobile home in – say – Oregon, New Mexico, or maybe even Texas. Thank you Crystal for this website! I visit it regularly. Hi Arlene! Thank you for visiting and commenting! Your home sounds amazing – that’s exactly the type of community I want to retire in. Resident-owned communities just makes so much sense. I’m so glad it’s becoming more common. We have lived in a 55+, deeded lot, ROC here in the Northern California Gold Country town of Sutter Creek for around 3 years now. This community was originally developed as a ROC back in the early 1970’s. According to several long time Owners when it was originally developed it was a really upscale nice place. Forward almost 5 decades it now has a few issues. 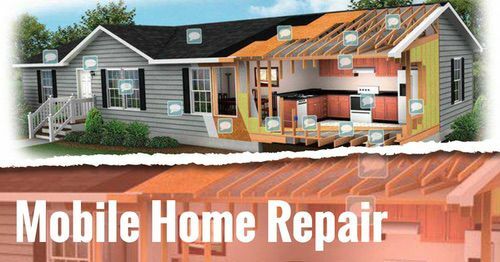 Due to the low real estate values a percentage of the places have fallen into disrepair. The median home value in the area is probably $400K or so. An older singlewide in here is probably worth $100K and a doublewide $130K. We have deeded lots here but co-own the common areas including the streets, pool, clubhouse. We bought our place as is even though the CCR’s clearly state they are to be brought to a “first Class” state prior to sale. We took our 1973 singlewide down to a skeleton leaving only the framing and roof and started with a clean slate. After $25K and 1000 sweat equity hours everything is new, efficient and up to date now. While I can’t reasonably expect everyone to do what we did we still have a lot of room to improve as a community. We probably have 10% full replaced and another 5% fully modernized like ours. With the value disparity between the areas homes and our Community I really can’t figure out why more Baby Boomers aren’t purchasing and upgrading here. I served on the Board and was the Architectural Committee until the first of this year. I didn’t seek Board re-election as we travel 4 to 6 months every year. Part of the new regime tried to boot me off My Architect Committee Chair position stating I was considered too aggressive. After several letters back and forth I decided to quit. This after watching the many upkeep and modernization actions I had requested reaching a 75% or so response level. I understand several of the new Board Members decided we needed to be kinder and gentler. My Professional Life for 40+ years was as a heavy Construction Superintendent. I always had to straddle a fence between our Owner/Clients and our Subcontractors. So I would describe myself as more of a Passive/Aggressive personality. This style didn’t work with the New Regime I guess. Time will tell if their style will produce any results. My early take on the New Regime is they are living in LaLa land. Even during my tenure on the Board I felt the Community members who dug in hard were allowed to run the show while the Board hid in a corner. Looking through the Owner files there were only several enforcement actions ever attempted. Unfortunately, the conscientious Owner’s are being damaged by this. Don’t get me wrong, this community is far from being a slum. Unfortunately, due to the age I feel it could easily become one if a Community wide firm stance isn’t taken. There is a similar Community around 15 miles away that has seen property values double in the last 3 years and looks really nice when you drive through. I used this community as a reference point multiple times in my conversations with other Community Owners. They still were reluctant. Somewhat as a comfort I will do a Google Street view of the Community. The Street Views are from 2007. There has been a significant improvement in that time but the steady decline and holdouts are still here. I suspect that with many elderly residents, they have a greater fear of pricing themselves out of a home than they have of a declining park. It’s a “let me get my life over with and then you can do whatever you want with the place” attitude. Until then, they refuse to encourage anything that they believe has the potential of improving things so much that they can’t afford living there any more. The selling feature for any upgrade/improvement plan has to be the increased value that the owner can pass to others with very little investment on their part. But the clincher, to them, is what is “very little investment.” Many feel they can’t afford an increase of $10 a month on their fixed incomes. That is why many older parks, even resident owned, don’t turn into the Ritz. Price security is more important than aesthetics and and promises of future reward. You make a very good point. I’ve read a few stories about parents leaving their homes to the kids but they failed to do the proper paperwork so the park ends up getting to keep the home. It’s a sad situation all the way around.